Today is Veteran’s Day, a day honoring the men and women who have provided military service to their county. I’d like to send a personal thank you to my father, my uncle and other friends who have risked it all to protect these United States of America. November 11, 1918, is generally regarded as the end of “the war to end all wars,” i.e. World War I. 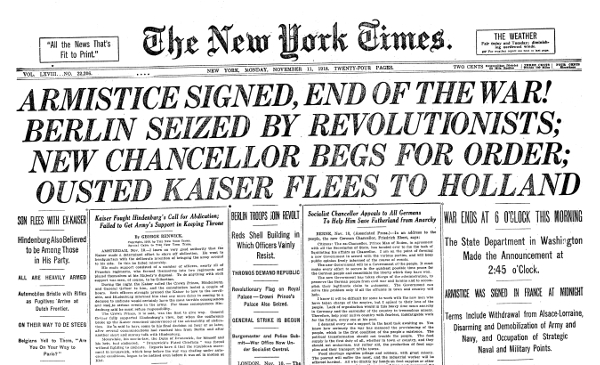 The official end of WWI was June 28, 1919. This is when the Treaty of Versailles was signed; however, fighting ceased seven months earlier when a temporary cessation of hostilities, an Armistice, between the Allied nations and Germany went into effect on the eleventh hour of the eleventh day of the eleventh month. It was still a bloody day as 10,944 casualties including 2,738 who died on this, he final day of fighting. The last American was killed at 10:59 AM. 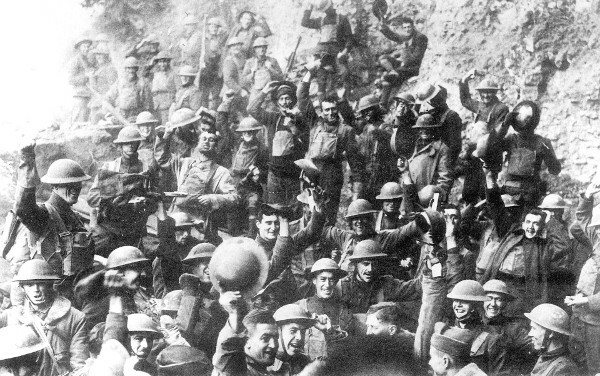 US 64th Regiment, 7th Infantry celebrate the first Armistice Day. In November 1919, President Wilson proclaimed November 11 as the first commemoration of Armistice Day. The original concept for the celebration was for a day observed with parades and public meetings and a brief suspension of business beginning at 11:00 a.m. In 1938, congress proclaimed the 11th of November a legal holiday – a day to be dedicated to the cause of world peace and to be thereafter celebrated and known as “Armistice Day.” It was a day to honor veteran’s of WWI. Unfortunately, WWI was not the war that ended all wars, so in 1954, the act was amended by replacing Armistice with Veteran’s. For the last 60 years, November 11th has been Veteran’s Day, a day to honor American veterans of all wars. 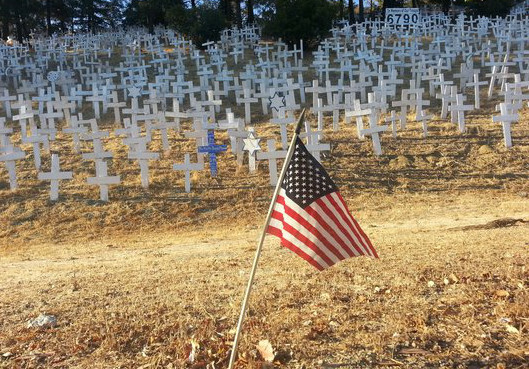 The hillside near the Lafayette, CA, BART station is a large reminder that war continues to happen, almost 100 years after the end of the war to end all wars. November 11th is still celebrated as Armistice Day in many nations. People observe one, or more commonly, two minutes of silence at 11:00 a.m. local time as a sign of respect. The first minute is for the roughly 20 million people who died in the war, and the second minute is dedicated to the living left behind. The holiday has also evolved into Remembrance Day and Poppy Day, in other nations. How can you support a Veteran? The five word title of this article is a good place to start. Thanking a veteran for his or her service is always appreciated. Like many of my favorite Plastic Surgery procedures, it is direct, simple and effective. Organizations that support our troops range from local, like the Blue Star Moms in San Ramon and Danville, CA, to national, like the Wounded Warrior Project; from broad to specific, like the Navy Seal Foundation; from active duty, like the USO, to retired. There are many ways to support our Veterans, and no better day than today. Sincerely, Thank You for your service. « Can Old People Have Plastic Surgery?